A thirsty koala rescued from the Australian wildfires has become a star on YouTube, providing much-needed relief from the disaster that has killed more than 180 people. Firefighter Dave Tree stumbled across the female marsupial, nicknamed Sam, as he was battling blazes in Victoria state and was amazed when the parched animal guzzled down water from a bottle as he held her scorched paw. 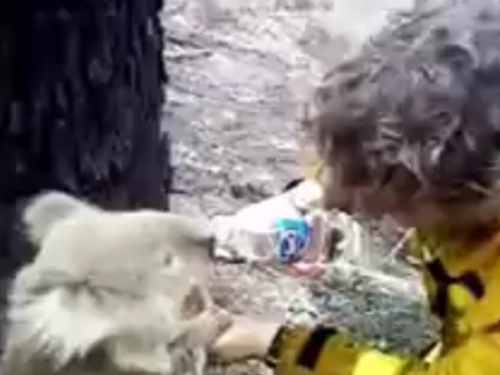 ‘Things do survive the bushfire ... are you alright buddy,’ he says in the footage captured by a fellow volunteer on a mobile phone. Mr Tree described the koala as ‘looking pretty bewildered’. ‘This is amazing ... how much can a koala bear?’ he said as he poured two bottles of water into her mouth. Koalas' cuddly appearance sometimes leads to them being likened to teddy bears, although in reality they are notoriously ill-tempered and possess powerful claws capable of inflicting savage wounds. However Sam sat placidly as the firefighter gently stroked her. The clip has attracted more than 30,000 hits on YouTube and Melbourne's Herald Sun newspaper is selling photographs of the extraordinary encounter, with proceeds going to volunteer firefighting organisations. The newspaper reported the animal suffered burns to her paws and was in a lot of pain, but was on the road to recovery at the Mountain Ash Wildlife Shelter. However, wildlife experts fear millions of native animals may have been killed in the firestorm. ‘It will be in the hundreds of thousands, possibly millions,’ Gayle Chappell from the Hepburn wildlife shelter said. ‘We are not just talking the animals we are familiar with, there are gliders and all sorts of possums, antechinus (a mouse-like marsupial), bandicoots, birds - there is so much wildlife. Victoria police on Wednesday issued an appeal for supplies for pets affected by the fires. They said donations of food for cats and dogs, rugs, blankets and feed for horses and any other animal supplies would be gratefully accepted. Police say the bushfires, which swept through Victoria state on Saturday night, are suspicious as there were no reports of natural events such as lightning that would have sparked the blazes.